I’ve got another review up on Shiny New Books, Chase F. Robinson in “Islamic Civilization in Thirty Lives” has written an accessible introduction to the lives of some of the founding figures and important people in the first 1,000 years of Islamic culture and civilisation, with lovely illustrations and a good solid academic framework without being hard to read. Read more here and thank you to Thames & Hudson for sending me a copy of the book in return for an honest review. I’ve got another full review to publish tomorrow so I’ll add to this by sharing my wondrous Foyle’s bounty from yesterday. 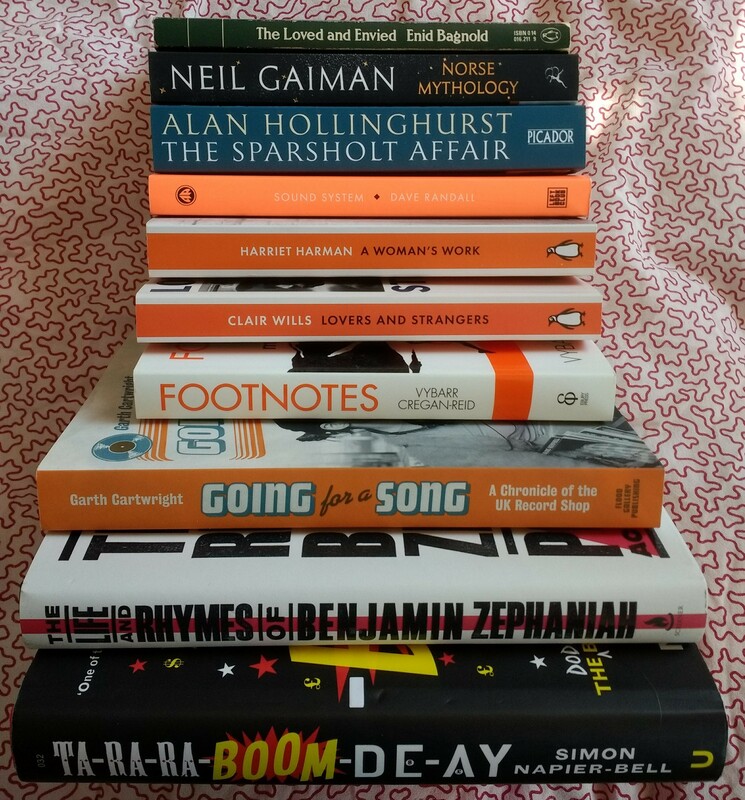 I gathered together all the book tokens in the house, including some half-used ones with very odd amounts on, and as the TBR was sort of getting under control and I’d seen loads of things I wanted to buy last time I was in the shop, had a bit of a splurge. But look what I got! Simon Napier-Bell – “Ta-ra-ra-boom-de-ay: The Dodgy Business of Popular Music” – Napier-Bell is a legendary rock manager and this is full of anecdotes and naughtiness. In the sale for 75% off but also exactly the kind of book I enjoy. Benjamin Zephaniah – “The Life and Rhymes of Benjamin Zephaniah” – I heard about this being out the other day and had to get it, after all, he’s local and I love his novels and poetry. This is BRAND NEW (shocking for me) but had £5 off the hardback price. Garth Cartwright – “Going for a Song: A Chronicle of the UK Record Shop” – one I’d identified as needing to be bought the other day. Vybarr Cregan-Reid – “Footnotes: How Running Makes us Human” – this one has been on my radar for a while and read by a few running friends, and I couldn’t not have ONE running book on the list. It’s an investigation of why we run and get so much out of it. Harriet Harman – “A Woman’s Work” – had to be bought and will form an interesting contrast / companion to Jess Phillips’ autobiography. Dave Randall – “Sound System: The Political Power of Music” – a Left Book Club publication which was also 75% off in the sale, finding the ways in which music has been a force for social change as well as a way to keep people in their place. I’ve just been reading a fascinating history of grime music which situates it very much in its socio-political context, so this seems a good buy. Alan Hollinghurst – “The Sparsholt Affair” – quite a left-field one here, but I dimly remembered the author saying he’d been influenced by Iris Murdoch and this does look like a very Murdochian plot, with a group of friends from university staying in touch down the years. The only fiction book in the pile! Neil Gaiman – “Norse Mythology” – his retelling, I have been feeling faintly guilty about not having bought this since I bought that other book on Norse mythology in December, so redressed that. These two were also Buy One Get One Half Price and yes, I chose the black cover for this one – more practical than the white. … and finally, I was in town to meet up with the lovely Claire from the LibraryThing Virago Group, who was up here for a conference. She kindly passed me a Virago Green of Enid Bagnold’s “The Loved and Envied” as an extra acquisition for the day. Have you read any of these? Which of them should I put first in the (back end of the) TBR? It had got quite a big gap in it after my good reading month in Feb and on-going efforts, so it should all fit on the doubled shelf still. And book tokens DO run out, and I wasn’t going to risk that happening! But yes, indeed! Wonderful pile of books there, such a pleasure to spend time in Foyles. Looking forward to hearing about the Hollinghurst (I have read just two of his and really enjoyed them) and the Harriet Harman. Happy reading. Thank you, I am looking forward to getting to them (of course I should have got the TBR down a bit first so I’d get to them sooner …). Yes, I was pleased at the range. Unfortunately, they now go at the back of my TBR although I’m contemplating a new, “one from the start, one from the end” strategy (ooh!). I suspect you’ll get to it before I do. He’s a bit of a mystery to me but the Murdochian connection and the plot appealed. Bar this one, I’ve read all Hollinghurst’s novels and enjoyed every one – but especially ‘The Line of Beauty’. I’ve had the Neil Gaiman Norse Mythology book on my bedside table (or various other places around the house) for months. I really want to read it, but I’m waiting for some uninterrupted time. I know what you mean – it deserves a good solid go, doesn’t it. Even more like that is my big illustrated alternative version I bought in December. I need to have a Norse Mythology Holiday, clearly! I can always tempt you with a haul photo, can’t I! Neil Gaiman of course is a huge hero. Hollingshurst has been going for a while, The Swimming Pool Library is perhaps his most famous book. Harriet Harman is a UK Labour politician, I’ve transcribed her and she comes over really well so I’m looking forward to this. Zephaniah is an amazing poet, you should look up some of his stuff, and he’s from Birmingham, too. His YA novels are wonderful, funny, devastating and inclusive works that should be read by more people but his poetry is a maz ing. What a great book haul! I love the sound of Going for a Song – my husband has recently discovered a love of reading so I think I might buy this for both of us to read (our house is slowly disappearing under our book and record collections!). Hope you enjoy all of your new books. Yes, I can’t wait to read Going for a Song, that’s more my obsession but I do like a good record shop and a good book about them. It’s going to be a while before I get to Footnotes, unless it’s a book of the month in some group or other. I am looking forward to it, though. You’ll know when I’m getting close to it if you want to readalong, but it will be months rather than weeks!